Over the year I have posted several blogs about maximizing your after-tax commission dollars. I started by sharing two simple facts: Commercial real estate commissions equal income. What happens after commissions equals wealth. I continued by outlining a 4-step process for creating wealth. Step 1 is building your personal commercial real estate business. This first step had 6 essential components. If you haven’t implemented these 6 components in your business, you are limiting your ability to consistently generate high-quality, high-value commissions. Step 2 is to create a structure for minimizing your taxes on your commission income. With the assistance of Kevin Bassett, CPA (who is more of a tax strategist), we outlined the advantages of creating a personal S-Corporation. This is a format that is available to anyone, regardless of the level of experience in commercial real estate. If you missed the first two parts of this series, you can read them here. 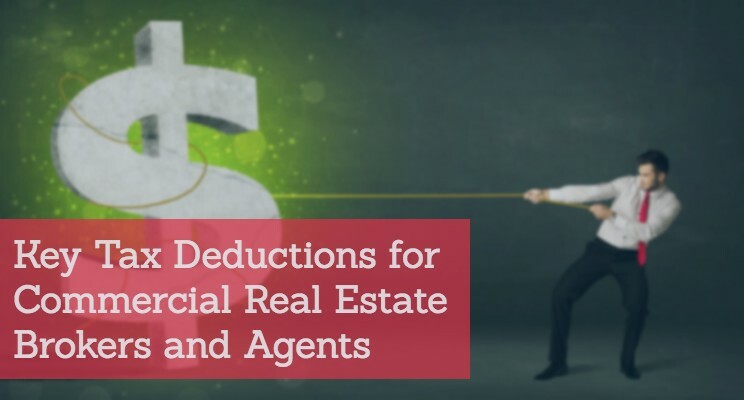 Today, in the final part of my series we are going to explore key deductions available to commercial real estate professionals. Before we dive into key deductions, remember everyone’s situation differs. Remember to consult with your tax professional, financial advisor, and/or attorney before implementing any of these specific strategies. As an independent contractor you have expenses associated with performing your business. These are important deductions, or owner’s discretionary expenses. Undoubtedly, there are things that you are paying for that you did not consider deductible. Now that you are a business owner (if you are an independent contractor, you are a business owner) they are now deductible. So, what you may have previously paid for with after-tax dollars, you can pay with pre-tax money — which means you are lowering your taxable income. The most controversial deduction is the home office. This has received both bad and incorrect press, and some myths about the validity of this deduction continue to live on. When we surveyed our audience on whether they take a home office deduction or not — most were confused on whether they could take advantage of such a deduction. According to Kevin, this is no surprise, and a few factors need to be considered. First, a home office deduction is alive and well — and safe. The idea that it was a red flag came about back in the 90’s when there was a bad case out of the 9th circuit in California. A physician was seeing patients at the hospital, and then going home and doing all transcription — back when there was such a thing. He was then writing off his home office on his tax returns. The doctor’s return got flagged and audited, and they lost. What happened in this decision was very much outside the intent of the law. Congress went back the following year and rewrote code section 280, dealing with home offices — and clarified it, making it much safer. Since then, the home office deduction is not grounds for future scrutiny by the IRS. The method up through 2013 was that you took a percentage of your home (based on square footage) and then you deducted part of your utilities, mortgage, interest, property taxes, insurances, etc. — and that was your deduction. Then, starting in 2013, it got even better. They added what’s called a Safe Harbor method, where you can basically write off up to $1,500 — without any substantiation. You didn’t have to fill out the additional forms. The beauty of Safe Harbor is it’s guaranteed write-off, and they cannot (and will not) audit it. Safe Harbor means audit proof. So, at a very minimum, everybody should be taking that $1,500 deduction on your next tax return. That is a free deduction, the IRS is giving you safe harbor. So, take the home office deduction. One important note if you’re using the original method (using square footage), when you sell your home you would have to recognize a potential gain on the percentage of the home that you’ve declared as home office. Let’s say, for example, you’ve figured out that your office was 12 percent of the square foot at your home. If you sold your home and it depreciated $100,000, you’d have to recognize $12,000 in capital gain income. There is no income threshold where that deduction goes away. All income levels get this deduction. Of course, the higher your income, the higher your tax bracket — and the more this deduction is worth. The $1,500 Safe Harbor deduction is per business, if those businesses are using up to 300 square feet of space in the home. For example, if you have a business (and you are using 300 sq. ft. of your home) and your spouse has a separate business (using a separate 300 square feet), then you can take two $1,500 deductions. If you’re sharing the same space, you can’t double dip. You can take the deduction, even if you own your own office. For example, you may have an LLC that you pay rent for the main office you own — and in addition to it, you can take a $1,500 a year home office expense on your corporate tax return, for the work you do in your personal residence. In addition to your home office deduction, there is the Augusta Rule. If your business uses your home for some sort of a business event, you can pay rent for the use of that home. As long as that’s less than 14 days or less per year, that income is deductible on your business return. But not taxable to you, personally. The reason they call this the Augusta Rule is because a congressman from Georgia took care of his constituents that rented their house out during the Master’s golf tournament. They got thousands of dollars. And they put in the tax code to say, “Hey. That money is tax free.” Now we can all benefit from it. You can rent your home out on Airbnb for up to 14 days, and that’s tax-free money. And/or you can rent to your business as part of the 14 days and deduct that as a business expense — while getting it tax free, personally. For example, perhaps you have a holiday party, corporate retreat, or corporate meeting at your home. Remember, this is different from doing work at home under the home office expense, this is another way to write-off part of your home pre-tax. To determine what reasonable amounts are for this, find out what executive rentals are going for in the area. Come up with a daily rate. Look at hotel conference space. Use these costs to determine reasonableness. Aside from the home office deductions, the most popular deduction is your vehicle. For the most part, everyone has a vehicle, and you should write it off in some form or fashion in your business. The question is, what’s the best way to do that? You can buy or lease your vehicle and then deduct the cost (either using the actual expense or standard mileage). If it’s a truck, you can write off a substantial amount in year one. If it’s a passenger auto, the deduction isn’t worth as much. Here are some rules of thumb. If you’ve got a truck that weighs more than 6,000 pounds, you can write-off a bunch of it right away. Assuming you have at least 50 percent business use, you’re going to always want to purchase it in the company. If you’ve got an SUV that weighs more than 6,000 pounds, you can write-off up to $25,000 in year one. And you should always purchase that in the company. Sedans that weigh less than 6,000 pounds (this also includes small SUV’s, etc.) is where it gets tricky. What Kevin and his team will advise: if you’ve got high mileage, and you’re going to keep your vehicle a while, just own it personally and take the standard mileage rate of 54 1/2 cents. This is especially true if you’re driving a Honda or a Toyota, an efficient car. If you’re the person that puts on a lot of miles, and keeps your cars a long time, just own it personally because you’re going to make out better taking the standard mileage rate. Driving more than 50 percent for business matters if you’re going to purchase the vehicle inside the company. You can only have the company purchase and own the vehicle if it’s going to have at least 50 percent business use (meaning more business than personal). Any time you’re in a situation where you’ve got a vehicle, but maybe it’s the spouse’s car — and you’re going to drive it only 10 percent for the business…that you’re going to keep outside the company. How does the IRS know? Well, on your tax return you’ve got to disclose the amount of business and personal miles. If, and when, you are audited — you must have a standard mileage log. Your mileage log must include the date of the trip, total miles for the trip, and the business purpose, and then a total for the year of business vs. personal — and that should match what was disclosed on the tax return. It’s common that folks will forget to fill out that vehicle section, with the mileage, on the tax return. And sometimes, that alone will trigger an audit. Are miles driven to and from the brokerage office considered business miles? It depends if you’re declaring your home office as your primary business location, or the brokerage office as your business location. If I work at Starbucks while out and about (to use their Wi-Fi), can I deduct my coffee? When you go to Starbucks, and you’re doing business, you pay for the coffee on your business credit card — but it’s going to fall in the meals category and it’s 50 percent deductible. Your cell phone? That is a no-brainer, it’s deductible. According to Kevin, the IRS doesn’t even look at it anymore. Home internet expense, that’s fully deductible by the business. As you can see, being a business owner has its advantages. Review these materials with your tax professional, financial advisor, or attorney — and start taking these available, legal steps to keep more of your hard-earned commission dollars.